The ranch has a warm, welcoming atmosphere that will make you feel right at home. 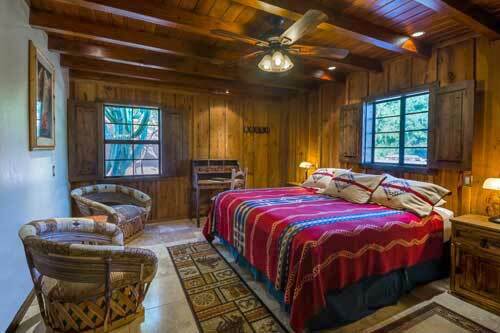 Guest rooms are spacious and charming and situated throughout the ranch. We have 43 guest rooms and The Hacienda, a lovely 5 bedroom, 3 bathroom home perfect for larger families, family reunions, girlfriend get-a-ways or small groups. Every guest room has a private patio with views of the cactus gardens, mountains, or corrals and many feature patio fireplaces. Generous floor plans offer sunny, comfortable rooms with plenty of closet space. Adjoining Deluxe King Twin rooms create Deluxe Family Suites which comfortably sleep 8 people and offer 2 full bathrooms for busy mornings. Our friendly housekeeping staff cares for your needs daily and all guest rooms are supplied with eco-friendly soaps, shampoos and lotions. Hair dryers, mini-refrigerators and personal safes are found in all rooms. 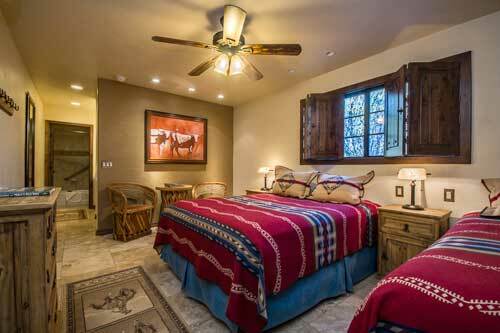 A White Stallion Ranch vacation offers a unique, easy to budget travel experience. Our Full American Plan rates offer outstanding value and are quoted per person per night or by the week. Prices vary with the season and type of room reserved. Tax and service charge will be added. Packages and discounts are detailed on the Specials page. 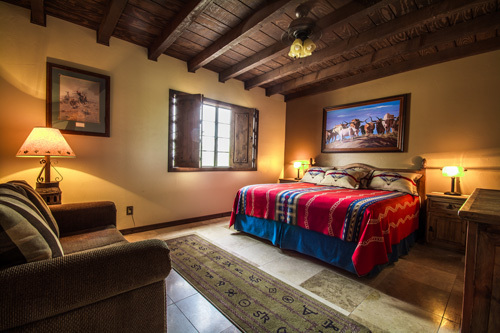 Our Full American Plan rates include lodging, three meals daily, horseback riding, ranch activities, evening entertainment, wireless internet, and airport transfers from Tucson International Airport with stays of four nights and longer. Riding Lessons, Rock Climbing, Shooting, Fat Tire E-Biking, Bar Charges and Spa Services are not included in the daily rate. We are experimenting with some new outdoor activities, and you are invited to participate. Now you can add Shooting, Rock Climbing, Team Cattle Sorting and Fat Tire E-biking to your vacation for no additional charge – just by booking a 4 or 6-night stay, depending on the season. You’ll be shooting Cowboy style Henry Yellowboy .22 caliber lever action rifles and Ruger .22 caliber single action pistols on the Ranch shooting range with our certified instructors. The expanded Rock Climbing is based on top roped bouldering and top roped single pitch climbing. Climbs range from 30′ to 60′ with difficulty ratings from 5.3 to 5.12+ with every rating in between. We currently offer 30 different routes and are still expanding. Don’t miss exploring the Ranch with friends and family on one of our Radpower Fat Tire E-Bikes. Use the power when you need it and peddle when you want, it’s a brand new way to see the Ranch at your own speed. Your stay of 4 nights or longer qualifies for our new Adventure Package ~ unless you book during the Holidays or Spring Break when your length of stay increases to 6 nights to qualify. Complimentary Airport Transfers from Tucson International Airport are included with this package. Should your stay not qualify for our new Outdoor Adventure Package these new activities are available on an a la carte basis. Be sure to take advantage of this incredible value as we experiment with new ranch activities! Perfectly placed for viewing our spectacular Arizona sunsets, these rooms include tile floors, solid wood furniture and granite vanities. They offer one Queen bed and one Twin bed and bathroom with separate vanity area. You’ll be right next to the horses and conveniently located near our main lodge and dining room. This guest room is 303 square feet. Our Deluxe Single rooms offer a Queen OR King bedding option. The Deluxe Queen Twin and King Twin rooms offer picture-perfect mountain or cactus garden views. Both offer a cozy seating area and a desk. Private patios with lounge chairs let you enjoy the afternoon sunshine in comfort. Deluxe King Twin rooms include a fireplace on the patio. The Deluxe Queen Twin room is 336 square feet, while the Deluxe King Twin room is 373 square feet. Perfectly placed for views of our spectacular Arizona sunsets and recently renovated, these rooms are beautifully appointed with tile floors, solid wood furniture and granite vanities. Our standard double room offers one Queen bed and one Twin bed and a spacious bathroom with separate vanity area. 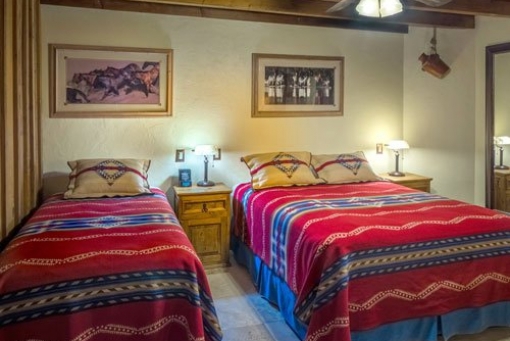 You’ll be right next to the horses and conveniently located near our main lodge and dining room. This guest room is 303 square feet. Deluxe Queen Twin rooms offer one queen bed and one twin bed, a spacious bathroom with separate vanity area and comfortable sitting area with couch and coffee table. These rooms are appointed with tile floors, solid wood furniture and granite vanities. Conveniently located near the pool and fitness center with views of our cactus gardens. This guest room is 336 square feet. Our Deluxe King Twin rooms offer picture-perfect mountain or cactus garden views. The comfortable sitting area is a great place to relax after a busy day. Large bathroom with separate vanity area. Private patios with gas fireplaces add to your enjoyment of Arizona evenings under the stars. Guest room square footage is 373. Our newly renovated Family Suites offer two bedrooms and are perfect for families or friends traveling together. In the master bedroom, you’ll find a king bed, while the adjoining bedroom offers three twin beds. These rooms accommodate up to 5 people, and feature a large bathroom, with a separate vanity area. You’ll also find a large closet, sitting area and desk in the master bedroom as well as a large sideboard in the front bedroom. Family Suites come with a private patio and views of our cactus gardens. Guest room square footage is 484. 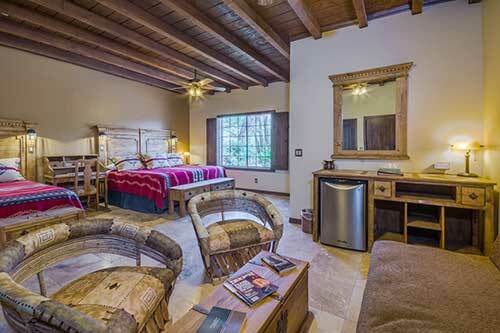 Our Deluxe Suites offer the highest level of comfort and luxury on the ranch. Equipped with a large living room with a Twin sized Daybed, Equipale table and chairs and working beehive fireplace, these guest rooms are the perfect place to unwind after a full day of activities. A luxurious pillow-topped King Bed in the spacious Master Bedroom provides a restful night’s sleep, along with a second Twin sized Daybed. These rooms also feature a beautifully appointed bathroom with Jacuzzi tub and a large vanity/dressing area. Private patios with fireplaces and views of the cactus gardens and East corrals let you enjoy the tranquility of the ranch and the warmth of the Arizona sun. Deluxe Suite square footage is 527. 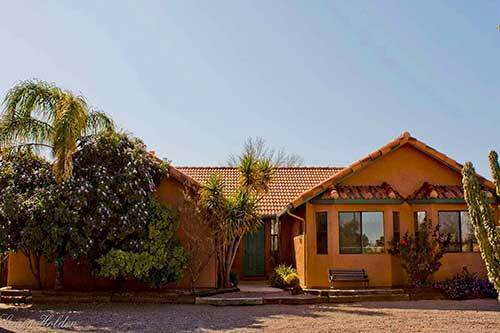 Perfect for large families, small groups of friends and fabulous girlfriend-get-aways. 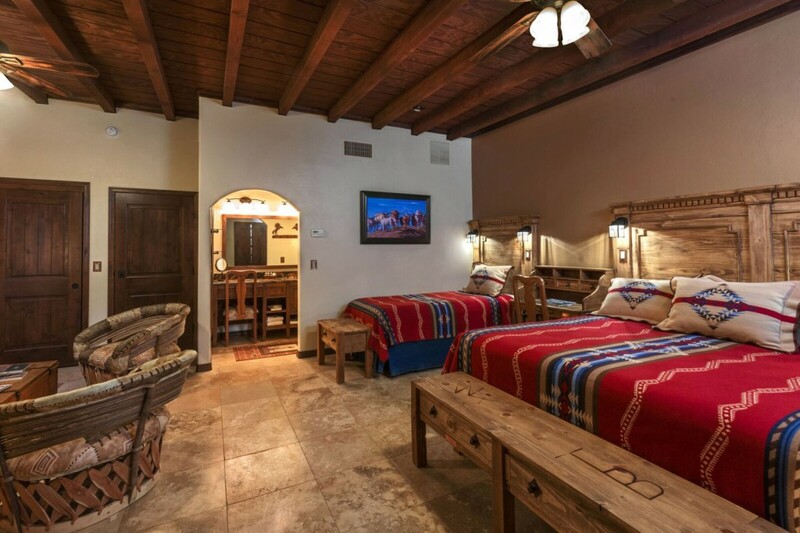 A real home away from home, our Spanish-style Hacienda offers accommodations for up to 10 guests with 4 bedrooms and a children’s bunk room that sleeps 2. The open floor plan includes a living room with a working beehive fireplace, separate dining room and plenty of room for families and friends to relax and enjoy each other’s company. The house has a fully equipped kitchen and laundry room as well as 3 full bathrooms and plenty of closet space. To enjoy the Arizona sunshine and stunning mountain views, simply step out into the private backyard complete with fire table and several seating options. The Hacienda square footage is 2,200.